Good mail day! 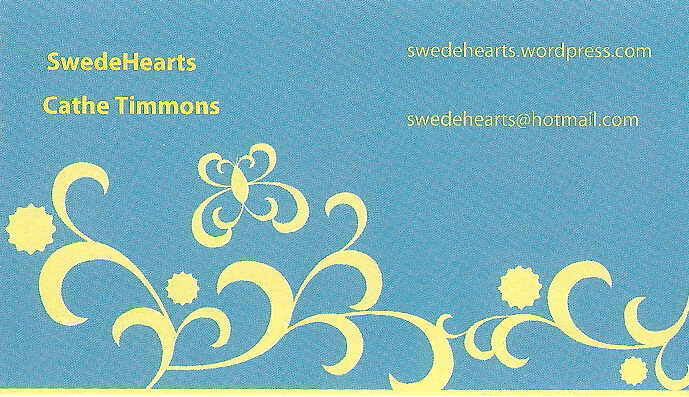 I received a free sample of shampoo, a coupon for a free 2 liter bottle of Diet Dr. Pepper, my first issue of Martha Stewart Living (free one-year subscription), and 100 free business cards for my Swedehearts business. These cards are for local clients, so they have my telephone number and address on them, which I have edited out of the image. They are nice cards from www.MarketSplash.com , with good color (which I got to choose from a broad palette) and smooth matte finish. I didn’t even pay for shipping! As with all of the free business cards, they have a fine print line of advertising on the back, but it’s unobtrusive. In real life, the colors are closer to those of a Swedish flag. I am very pleased with them.